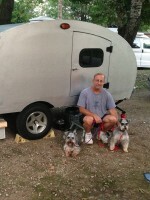 Teardrops n Tiny Travel Trailers • View topic - I want to build an Ultra-Light Teardrop. I want to build an Ultra-Light Teardrop. I'm starting to think about building a second TD. This time I'm thinking of an ultra-light. Who has built one? Who has pictures/designs? What does it weigh? What would you change? 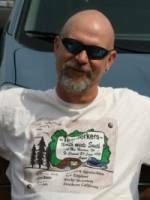 Peg's is a 4-by-8, sandwich construction, light frame, torsion axle.. I take it you've already checked out the Ultralight Design thread from top to bottom? I searched for an article like this but could not find it. Still reading. Thanks. I was dissapointed-I took mine to get it weighed and it came in at 560 lbs. I had hoped for about 400 to 450. But it still pulls pretty well. It will be awhile but I may consider a second effort in the future. I will be trading my full torsen axle for a pair of shorties-which should get me down about 45-50 lbs. I didn't have the cofidence to go really radical with hollow core door floor and cabin frame with 1/8" luan skin w/o aluminum, or all wood frame construction. There are some really creative folks here. Wheather you think you can or you think you can't, your right. I just finished reading the 15 pages on Ultralights. How is yours coming. Did you go with a straight tongue or an A frame? Did origimaly think of incorporating the HF frame into the floor (use the metalframe instead if wood sandwich)? don't confuse "creative" with, err, "not practical"
It's still on the bench in the basement. I had designed it to be 4' wide, andhalfway thru the build I decided I really want it to be 5' wide. I'm not sure the design is capable of 5'. So it's sitting down there, as a future project. Meanwhile, I've built the Escape Hatch/Winter Warrior which I designed a couple summers ago, and now my thoughts are turning to a more fully featured Winter Warrior. Meanwhile I want to do up a set of plans on ebay to increase the traffic here, plus I have a whole lot of CAD work I want to do. But I have to agree with Jay. Creative is not always safe. I would definitely bounce any ideas off of Andrew before taking an untested concept on the road. Mike, I can't see where there be any problem in making the ultralite into a 5 foot wide trailer? apratt wrote: Mike, I can't see where there be any problem in making the ultralite into a 5 foot wide trailer? 2) The sides are made out of 5mm luan. Is that strong enough for a torsion box, or do I need to have 1/4" baltic birch, with it's many layers? I imagine if the torsion box is strong enough, and the axle is wide enough, and the floor is stiff enough, then it shouldn't be a problem. Andrew, go ahead and take my theory and smash it to pieces! 1) not use H/F axle, buy an axle kit to the width I need. 2) go with 1" frame and 1/8 panel for the walls. 3) use the A frame set that Andrew showed. 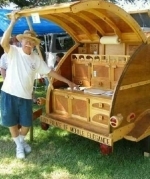 Gerdo, use a 40" x 48" HF frame, (150 Lbs) and build the 6 foot wooden teardrop using a 1 3/8" hollow core door for the floor, 1/4" sidewalls and 1/8" roof. All of this wood, with basic shelves and cabinets in the galley will only weigh 95 lb. I know, I did it and the TD only weighs 245 lbs. i understand "light" - but what is the purpose of "ultra-"? tow by bike or human powered craft? I can't either. The only things that the extra width affects are the roof spars and the floor. As I remember the Ultralight has a single skin roof, so the strength of the roof spars is quite important. On a 5ft span, even close-spaced 1x2s (with the 2 vertical) sounds a bit weak to me, but 1x3s sounds over the top, so maybe it's 1x3s cut down to 3/4"x2" actual. As the floor is a sandwich panel, I don't think the 5ft span is any problem - Mike drew 1/4" ply top and bottom which I think is probably overkill! My only concern would be the point load on the front of the floor if a single tongue is used - using a piece of oak (of the same size) instead of softwood would address that. I can't see any problem with the axle on a 5ft wide - except that you can't use a HF trailer kit. Either torsion or leaf spring would do, though I would have a preference for torsion as it provides a strong cross-member for free. On the subject of the axle, I have now seen a couple of places where it clearly shows that in full-beam torsion axles, the rubber goes nowhere near the middle, so Mike's original idea of welding a single tongue to the middle should work fine - though as I mentioned before, I guess you can kiss goodbye any warranty on the axle. I still prefer an A-frame for the lower load it puts on the body. Can you post any build descriptions and pictures so I can see how you kept the weight down. I don't want to over build but I also don't want to under build it and have it flimsy. I would hate to see it blow apart on the highway.